Since each of Spain’s regions has its own specialties, it is difficult to say that there is a single national dish of Spain. Historically, Spain was divided into small kingdoms, each one with its own language, culture, and cuisine. Spain remains separated into 17 autonomous regions, each one with its own unique cuisine. But there are a few dishes that have gained popularity all over Spain and some internationally that can be considered the country's national dishes. 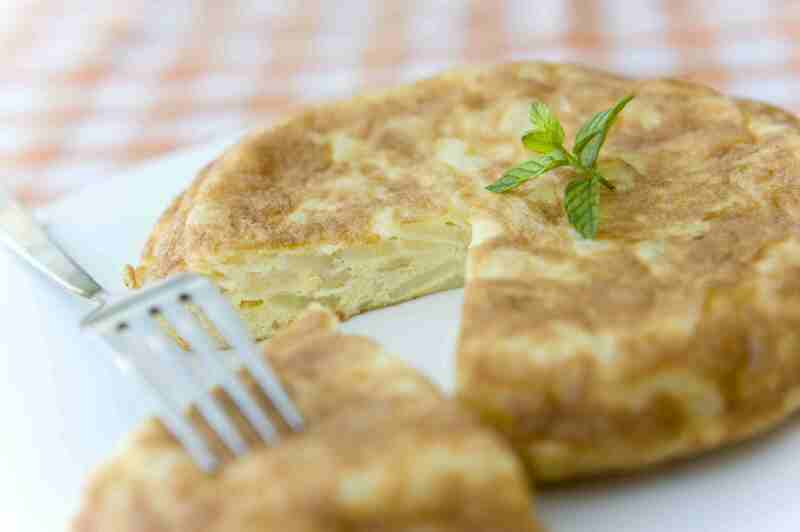 The most commonly served dish in Spain, the tortilla Espanola is the Spanish version of the omelet. In Spain, it is called tortilla de patata (potato omelet) because it is made with potatoes and eggs, along with onion for flavor. More like a crustless quiche than an omelet, tortilla Espanola is cut into wedges and served as tapas, mid-morning snacks, or sliced and used as a filling for a sandwich. This refreshing dish originated in the hot and dry region of Andalucia ​but is served everywhere in Spain during the steamy summer months. Served chilled, this tomato soup is silky smooth and can be either eaten from a bowl with toppings or presented in a cup as a drink. No matter which way it's served, it is a healthy meal or snack; it is simply made of fresh vegetables, a bit of bread, and oil and vinegar. Paella Valenciana originated in the fields of Valencia, where country folk mixed rice with rabbit, snails, and vegetables and cooked it over an open fire. It has evolved into Spain’s most well-known dish, in which fish, shellfish, meat, pork, and chicken might be variously used. No matter what protein is added, no paella would be complete without its signature seasoning of saffron, which also contributes to the dish's orange hue. Several regions of Spain are known for the ham they produce, but it is eaten all over the country and considered prized gourmet food. When it comes to air-dried cured ham, Spain is both the largest producer and the biggest consumer of cured ham. Cured ham varies widely in Spain—from affordable to expensive—but it is readily available in grocery stores. There are two types of Spanish ham: jamon Serrano and jamon ​Iberico. Jamon Serrano is made from several breeds of white pigs and is cured between seven and 16 months. A wide variety of chorizo sausage is eaten in every corner of Spain on a regular basis. Chorizo is a pork sausage that is most often cured, although you may be able to find it fresh. It is made of chopped pork that is marinated in spices that include paprika, and it is the paprika that gives the chorizo its familiar flavor and color. The casing is edible, and the chorizo is eaten simply sliced, either alone or with bread, or is used in a variety of dishes as a key ingredient. How Do You Make Cochinillo Asado, a Spanish Roast Suckling Pig?